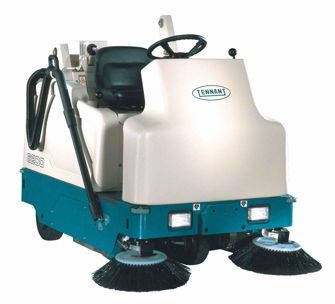 Tennant model 6200 is an industrial grade, self-propelled, power rider sweeper, manufactured in the U.S. The 6200 power ride on sweeper is ideal for sweeping small and large debris on any hard surface floor. The 6200 industrial rider sweeper also makes an excellent carpet sweeper for large areas. At the recommended operational speed of 3.0 MPH the 6200 industrial rider sweeper cleans at the rate of 52,000 square feet an hour. With fully charged batteries, the 6200 ride on sweeper will sweep for 3.4 hours. With the optional battery upgrade package installed, the 6200 will sweep for 4.8 hours. Power key ignition switch, and emergency power kill switch are both standard features on the 6200 dashboard. An integrated operator safety switch stops the 6200 power rider sweeper unless the operator is seated. Simple manual brush levers raise and lower all brushes, and are within easy reach of the operator. Both side brushes and main brush turn off when the brush levers are raised. Pictogram style use and care guide is mounted on the 6200 ride on sweeper next to the operator seat. Multi-level debris hopper is located at the rear of the 6200, and is operated via hydraulic system. Once the hopper is located over your debris container, you can open the hopper door and dump the debris. These hopper operations are performed while the operator is seated; no need to manually empty the hopper. Tennant’s VCS system filter shaker is another unique feature that cleans each individual filter panel pleat. Manual cleaning of the 6200 power rider sweeper dust filter is eliminated altogether. Downward sloped grid on top of the debris hopper protects the dust panel filter from flying debris. The 6200 ride on sweeper hopper can hold up to 4.4 cubic feet of debris. The 6200 industrial rider sweeper is available with optional dual side brooms for a category leading 55 inch cleaning path. Add the optional vacuum wand and clean tight corners and hard to reach areas. Other popular options for the 6200 are the rotating hazard light, and overhead guard.